Security in Europe, the anti-missile defense system, inter-confessional dialogue and Russia-NATO ties were the focus of talks between the presidents of Russia and Italy in Rome. 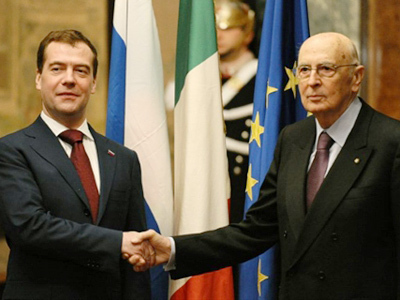 ­Russian President Dmitry Medvedev, who is on an official two-day visit in Rome, met his Italian counterpart, Giorgio Napolitano, in the presidential residence, the Quirinal Palace. “Russian-Italian relations are not only important, they are in fact key for building solid ties with Russia, when it comes both to the EU as a whole and separate member countries,” Medvedev told journalists after the meeting. Speaking about Russia’s economic ties with Italy and the EU in general, he said that euro as a reserve currency played a major role in tackling the global crisis. “I believe that euro as a reserve currency helped other countries, which do not use euro for payments to overcome the consequences of the crisis,” he said. In addition, he answered a question about Russia’s stance on the recent tension in the Middle East. “These are complicated processes. We believe that all conflicts will be settled on the basis of law, national constitutions, rights and freedoms which are provided for in the legal systems of the states now weathering difficult times,” Medvedev said. Culture which usually holds a marginal place in top-level talks is in the spotlight this time thanks to the official launch of the large-scale Russia-Italy cultural exchange project this year. The year-long program will feature numerous important events including exhibitions from major Russian and Italian museums and tours of the countries’ best theatre companies. Dmitry Medvedev called the Russian-Italian cultural exchange year “an unprecedented project”. he said. “I hope that this great cultural project will give a boost to our relations, advancing not only the business sphere… Culture has always been a significant element in our ties in the 18th, 19th, and 20th centuries. I hope it will characterize our relations in the 21st century as well,” he added. 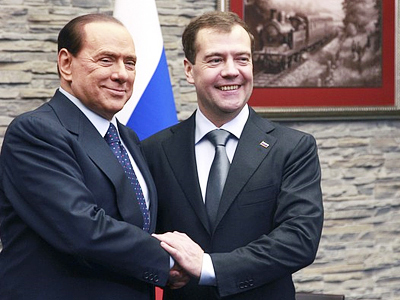 Dmitry Medvedev will also meet with Prime Minister Silvio Berlusconi. During the talks, the leaders will focus on trade and economic relations. They will discuss such practical issues as the cooperation of Russian companies with Finmeccanica enterprises, Italy’s second largest industrial group working in the fields of defense, aerospace, security, automation, transport and energy, and prospects of building a new gas transportation system from Russia to the south of Europe. Other issues include joint projects in the areas of nuclear energy and space exploration. Italy has long been one of Russia’s largest business partners and cooperation has been steadily expanding. In 2010, the trade turnover between the countries reached 36.8 billion dollars, an 11.5% rise compared to 2009. But it is not only quantity that matters, Russia and Italy are now looking to diversify mutual trade and to strengthen cooperation in high-tech industries. Moscow is keen to attract Italian investors to the research hub of Skolkovo, Russia’s version of the Silicon Valley. Wider issues of cooperation between Russia and the EU, particularly prospects of visa-free travel, the Iranian nuclear program, and the situation around Afghanistan are also on the agenda. On Thursday, his second day in Italy, President Medvedev will meet Pope Benedict XVI in Vatican. This will be the first visit of a Russian leader to the Holy See since the establishment of full-scale diplomatic relations between the states in 2009. According to Presidential Aide, Sergey Prikhodko, Dmitry Medvedev and the Pope discuss interaction between Moscow and Vatican within international organizations including the UN, the Council of Europe and the OSCE.